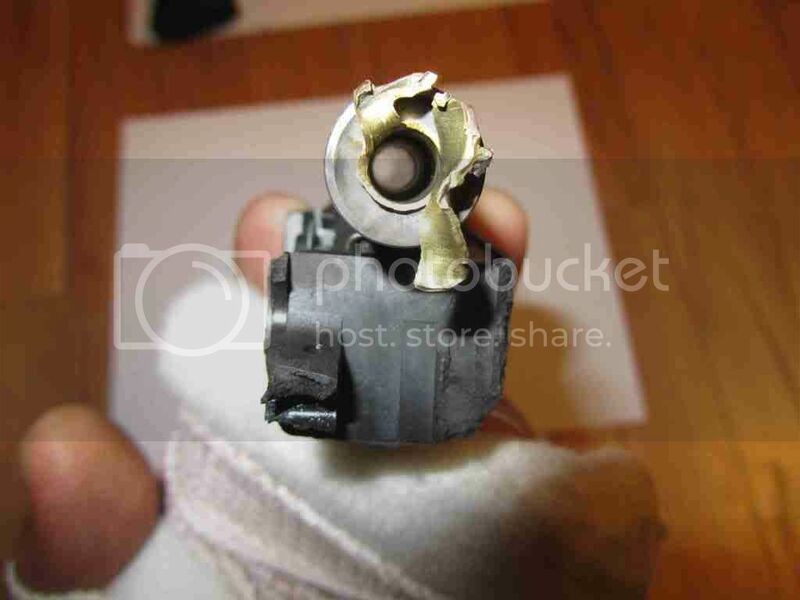 Last week my FN Five-Seven blew up causing severe damage to my left hand (I am right handed). There are 6-8 pieces of shrapnel deep in my thumb and palm area which severed the nerves to my thumb and a portion of my palm. Surgery is required in an attempt to repair the hand by harvesting tissue from my leg. Wish me luck. The “explosion” occurred on the last round of a 30 round mag loaded with the factory 40gr v-max stuff. On this particular day I only had three loaded magazines (70 rounds total) with me for the Five-Seven but had several other handguns to shoot after the Five-Seven. I began with a 20 round mag loaded with hand loads, then a 20 round mag loaded with factory ammo and finished with the 30 round mag with factory ammo. 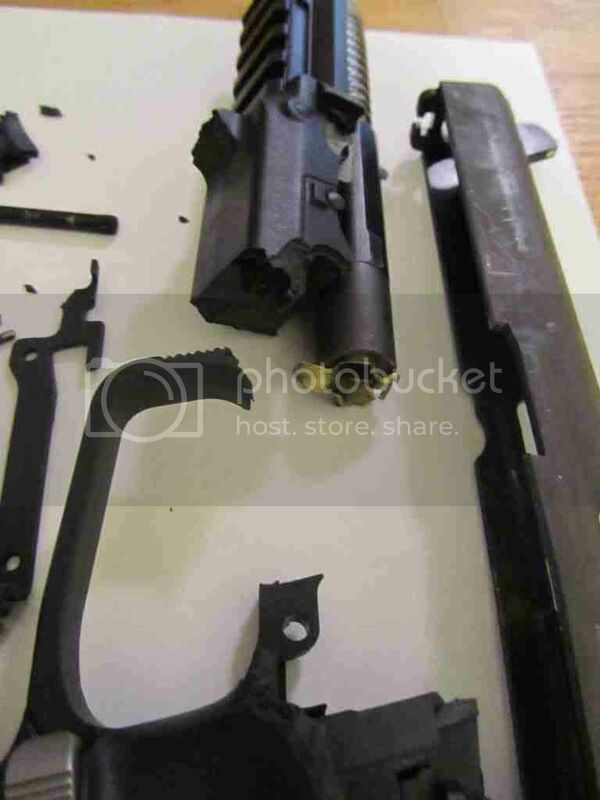 It was the very last round of 5.7x28 in my immediate possession that ruined my day ……. and a whole lot more!! I have fired (600-700 rounds) both factory and hand loads through the pistol with zero issues since purchasing new in 2/2011. There are reports of the Five-Seven firing out of battery (OOB) which appears to be the case here but I am no weapons forensics expert. I am not a novice to shooting, handguns or reloading and have 20+ years of extensive experience with shooting and reloading. I have been completely straightforward with FNH (i.e. Browning) so will now wait and see how they respond. I'm sorry to hear about your hand, and I wish you luck on your recovery! Not good at all. Best of luck for a speedy and complete recovery. WOW!! That is not good. Hope surgery goes well for you. Let us know what FNH says. I too wish you the best and am sorry for your pain. I am shocked at the amount of destruction to your hand and the weapon, even if it was out of battery when it fired. I would never have guessed it would have caused that much damage! 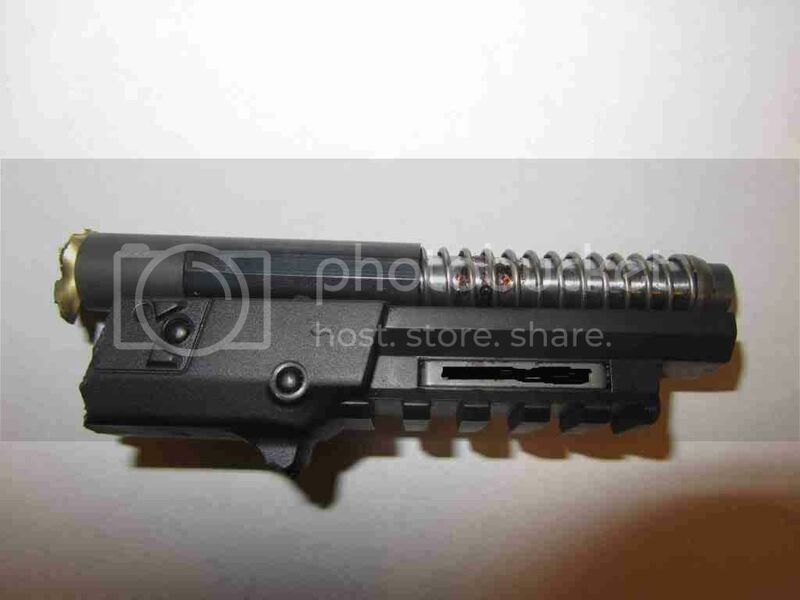 I used to be a firearms dealer and sold many of these. I have never heard of a bad one. I guess no gun is completely fool proof though. I always wanted to buy one myself. I think if I do, I will wear some Hatch gloves with Kevlar in them! Good luck, hope you retrun to health soon. Ouch! I wish you well in your recovery and rehab Fairchase. It's supposed to be hard. If it wasn't, everyone would do it. The hard...is what makes it great. Failing to prepare is, generally speaking, preparing very well to do the wrong thing. Reviews are only as good as the crowd reviewing them. Hope all goes well in surgery and the physicians can restore your hand to full use. Please keep us updated. I've never had any gun fire out of battery but I would expect bits of shell casing being thrown around but not that level of destruction. 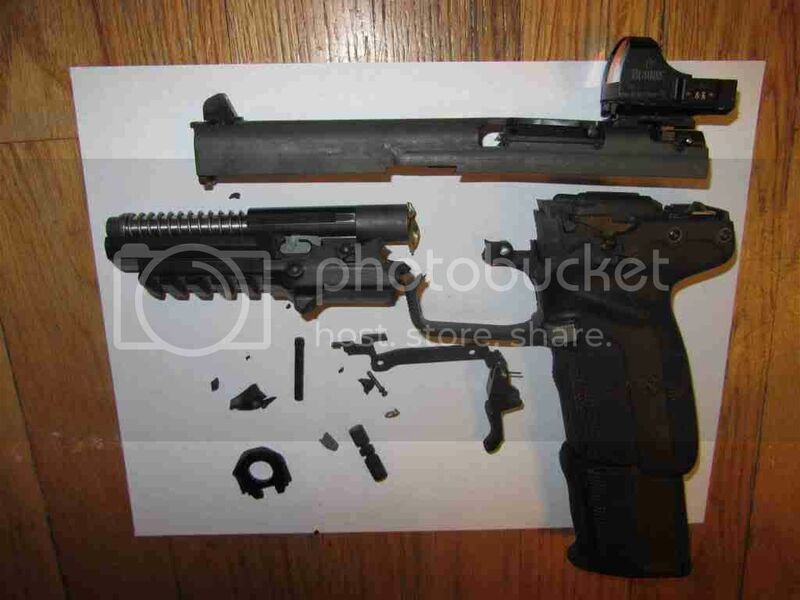 It takes a lot of power to tear apart a gun like that. Hope your surgery turns out well. No doubt FNH will want to inspect the pistol but I think it would be a good idea to have a gunsmith examine the remains, too. good luck wherever this leads. That cartridge seems like it would be awfully sensitive. Lots of pressure...real short barrel...tricky to get the timing just right. I would imagine it would be real easy to get overpressure cartridges. 45Kpsi does make for an impressive kaboom though. Hope everything goes well with the recovery. Are you going to keep with the 5.7? Or go to some tame and timid cartridge like 38 super or 9mm major?